NEWPORT BEACH — As dredging barges and scows begin to mobilize in Newport Harbor, city officials are hoping no further delays are on the horizon for the long-awaited Lower Newport Bay dredging project, set to remove some 500,000 cubic yards of sediment from the harbor. While it has been more than 70 years since dredging of this magnitude has taken place in the harbor, delaying is no longer an option, as nearly 130,000 cubic yards of the sediment scheduled to be removed must be transported to the Port of Long Beach by a June 30 deadline. The sediment, found to be unsuitable for ocean disposal, will be disposed of at the Port of Long Beach’s Confined Aquatic Disposal (CAD) site, which is taking sediment from harbors throughout Southern California to fill in 54 acres of water area between two terminals and form a larger new shipping terminal. Newport Beach already missed the port’s original March 14 deadline, but it was granted an extension to June 30 — a date that is quickly approaching. “Every conceivable effort will be made to meet that deadline,” said Newport Beach Harbor Resources manager Chris Miller. If the timeline isn’t met, and the Port of Long Beach decides to move on without Newport Harbor’s sediment, the city would be forced to dispose of the contaminated sediment at an inland disposal site — at nearly four times the cost. The result would be a highly diminished dredging project, with the current $7.5 million in funding from federal, city and county funds not covering nearly the amount originally anticipated. But at a recent Newport Beach Tidelands Management Committee meeting, Miller said dredging contractor R.E. Staite Engineering would work past the agreed upon 10 a.m.-6 p.m. Monday through Saturday schedule, and could possibly institute a 24-hour, seven days a week dredging schedule to meet the deadline. “That timeline could be brought in, but hopefully it doesn’t come to that,” Miller said. Starting April 30, two clamshell bucket dredges — one with an 8-cubic-yard bucket capacity and one with a larger, 14-cubic-yard bucket capacity — will enter the harbor, with dredging expected to begin May 1. The clamshell buckets area highly effective at grabbing large amounts of sediment from the surface without dredging too deep — an issue in the bay, as some areas have been tested for contaminants at deeper depths. Three disposal scows will be entering the harbor as well, and they are the same scows used in last year’s Rhine Channel dredging project. One scow holds 2,200 cubic yards of sediment, while the two smaller scows hold 1,000 cubic yards of sediment each. 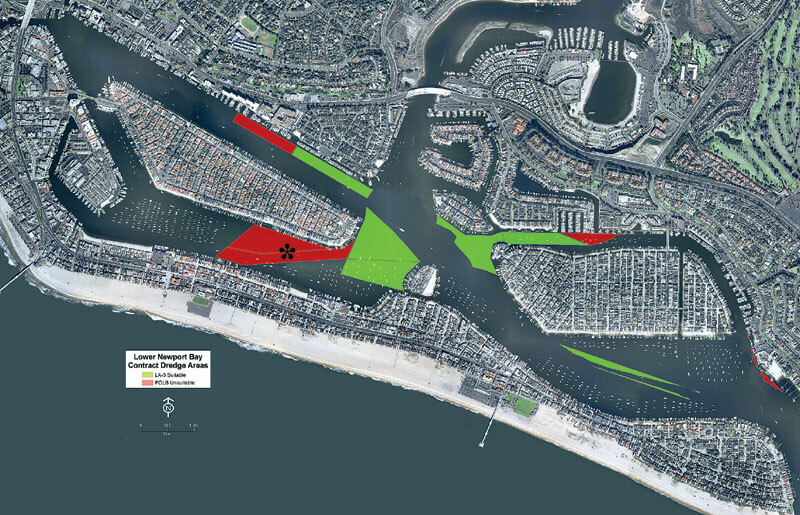 With the timeline looming, the dredging schedule will target the 130,000 cubic yards of contaminated sediment first, starting along Lido Isle’s south side, and along Mooring Field “F” and the Newport Harbor Yacht Club moorings. But before the contaminated sediment can be reached, R.E. Staite must dredge a path through the harbor’s Turning Basin, to allow the dredging barges to reach the sediment along Via Lido Soud. Miller said the team will have to line up its dredging schedule with the tides to ensure the scows can make it through the harbor when fully loaded. “They are going to be filled as high as they can fill them, and they are going to need to take advantage of the tides,” Miller said. Since December 2011, Miller has been working on outreach regarding the Lower Bay dredging plan, and he is continuing to work with mooring owners, nearby harbor businesses, sailing and yacht clubs, and other entities affected by the dredging. Dredging will take place in some of the harbor’s mooring fields, meaning some moorings will be temporarily relocated. Boat owners with vessels on moorings can contact the Orange County Sheriff’s Harbor Patrol to have their vessel reassigned a mooring, and move it themselves. Boaters can also have South Mooring Co. move the vessel to a nearby mooring for them. Most vessels at private and commercial docks will not be required to move during dredging, but a few that overhang into the federal channel may need to vacate their slips for a day or two. Miller noted in his weekly dredging update that that there will inevitably be splashing of water and sediment near the dredge zone, so it is highly advisable that boater owners move their vessels while the dredger is near their dock. The impacts in any given area are expected to last only a few days in front of docks and a few weeks in each mooring field.